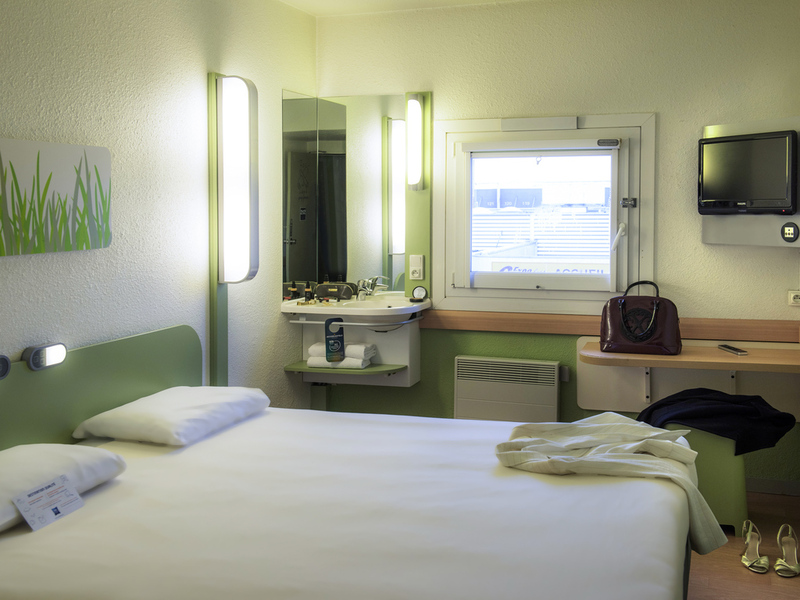 I used the hotel chain ELAN some years ago in France, I was disappointed to learn that the IBIS budget was the old Elan hotels, The facilities are clean and basic however I find that having no hand wash facility in the toilet / shower area potentially unhygienic. I have used the IBIS chain of hotels many times and always been pleased, in future I will not use your BUDGET type hotels. Sadly your rooms are not ideal in warm weather - you have to choose air - or light & noise from outside. I requested 2 extra pillows which ere forthcoming however - very grateful.Towels are tiny, and its impossible not to drench the whole WC area when taking a shower. It was great but the only problem is that there wasn’t an A/C. We were lucky to find this place because the address was just the name of a highway. My sat nav did not like that. We were driving around strange french roads clueless late at night with not a soul to ask except a lady of the night and her clients. Not ideal. Luckily managed to see a sign that gave us a clue where to go. Fix it IBIS. The guys in the hotel had a fix of a road across the street that is on the digital map. Not so hard to put it on the website. Other than that hotel was fine and good value. Upon entering our room I noticed the floor seemed to not have been mopped. I also found hair not in the shower. We were not expecting a &quot;backpacker&quot; hotel. Very noisy, football played at 2.30 in the morning outside our window . Not a pleasant experience. Shower was broken and not fixed. We had a terrible night. All the rooms had strong tabaco smell, even the non-smoking ones. A lot of noise during all night with people getting in and out. Outside with a strong feeling of unsecurity. We left the hotel in the firts hours of the day even we had one more night booked. You need to have caution when booking IBIS in France. A lot of them doesn´t have the same level of other countries in Europe. This time it was not a pleasant one. First of all the floor was not clean at all, the shower handle was very floppy, the electricity was cut off in the morning. Have been here before only once though. I've been here before when unable to use Cergy st christophe, as a hotel its actually better internally than Cergy with modern rooms, the building itelf is ok, but it feels that its in an industrial part of an area thats quite hard to find off the complicated motorway network nearby system. The breakfast is good, but only has a small space allocated for a number of tables, I must admit the staff at Cergy really do look after its customers and this is probably why that hotel is packed, this hotel isn't the same, I had a hot chocolate which didn't taste like hot chocolate but thought nothing on it till a local had one and informed the guy who deals with the machine, and only then did he start adding to all the contents.. I'm now beggining to feel that I should now move onto another brand of Hotel, I'm personally now in my second year of owning an Ibis Business card, and been using the Ibis brand for over the last two years, the Ibis Style is a nice hotel but does come with an even bigger price tag! Sir, Thank you for taking the time to share your thoughts. Although we would have preferred that your experience was more pleasant, your feedback and impressions are very important to us because they help us to improve our services every day. The satisfaction of our customers is our priority, but apparently we have not succeeded this time. If you give us the opportunity to regain your trust, we will be pleased to offer our customers the best welcome every day. Kindly accept, Sir, our best wishes. We booked through an agency but upon arrival, the hotel had no record of our booking. Despite trying his best, the night receptionist couldn't reduce the room prices to those we had booked so we had to pay in full - on our return from holiday we found a cheque for the difference waiting for us - PLUS the lovely man on reception had offered us a free breakfast to make up for the mix up. Could not fault the hotel - Friendly, welcoming staff, spotlessly clean, comfortable rooms, great prices and easy to find. We stayed there again on our return trip and will definitely use this hotel in the future. Thank you to the lovely staff members who made our stay so pleasant. We are regular Ibis users. Room and bed were good. Breakfast was poor - not presented carefully, croissant poor, orange machine did not work, Public areas, including breakfast area were not clean. Employee in the morning was not attentive.